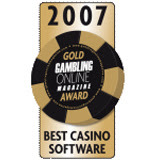 For the third consecutive year, CryptoLogic Inc. has captured Gambling Online Magazine’s Top Casino Software Award for world-class software. The award, based on the votes of thousands of readers, players and website visitors, is widely recognized as the industry’s top honour. CryptoLogic was recognized for its innovative gaming software, revolutionary gaming concepts and spectacular graphics delivered through its wholly-owned subsidiary, WagerLogicâ Limited. CryptoLogic has introduced some of the most popular games in the industry, including fan favourites Bejeweled, Jewel Quest, and the first-ever version of Multi-Hand Video Blackjack, a game that combines the excitement and action of Video Poker with the world’s most popular casino game. CryptoLogic also delivered the exclusive online slot version of Cubis, the award-winning, visually stunning 3D puzzle game, and its patented Millionaires Club, which boasts the highest jackpot payout in online history. “CryptoLogic’s award-winning casino lineup delivers big-screen excitement, stunning graphics, amazing bonus rounds and impressive prize pots — in pounds, Euros or dollars,” added Justin Thouin, CryptoLogic’s Vice President, Product Management and Business Development. With more than 280 games in its online casino suite — and more than 100 games launched since 2004 alone — CryptoLogic has one of the most comprehensive casino gaming suites on the Internet.